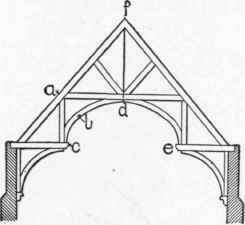 This is a type of truss much used for supporting open timbered roofs, especially in Gothic halls and churches. 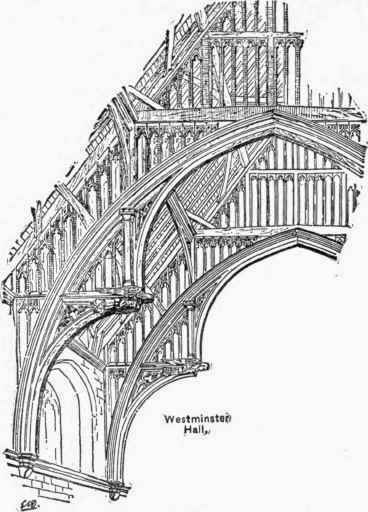 It is believed to have been first used in the great hall of Westminster Palace (Fig. 48), built in 1397, and different forms of it may be seen in many of the English buildings of the fifteenth century. The principal apartment of the palaces and educational establishments of that period was the hall, and most of these had beautifully framed roofs of timber, in which some form of the hammer-beam truss is almost invariably found. 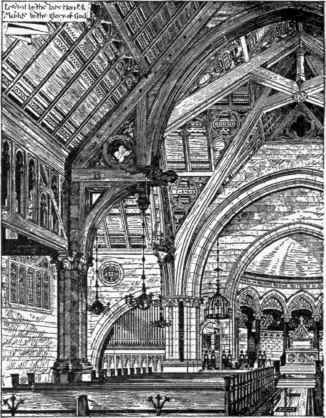 The hammer-beam truss was also occasionally used in the parish churches, but the wooden roofs of the churches were generally flatter and less deeply framed than those of the halls, and as a rule less beautiful. The truss derives its name from the horizontal beams at the foot of the principals, which were called "hammer beams." The typical shape of the truss as found in modern buildings maybe represented by Fig. 49, although it is difficult to find two trusses that are exactly alike in design. It is probable that when these trusses were first used it was expected that they would exert a small outward thrust on the walls, as the latter were usually very thick and generally reinforced by buttresses. By means of the curved brackets under the hammer beam, however, the thrust was applied at a considerable distance below the plate, and the direction of the resultant thrust was usually very steep. 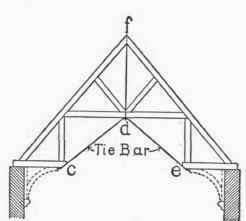 The action of the stresses in a hammer-beam truss may perhaps be best explained by means of Fig. 50, which represents a truss in the act of falling, owing to the breaking of the curved rib b and the consequent pushing out of the walls. As soon as the wall commences to move the whole weight of the upper part of the truss is thrown on the lower portion of the principal, and tends to produce rupture at the points a and b. 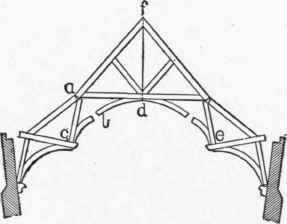 It should be evident from this illustration that without the curved rib b the action of the truss is virtually the same as if constructed as shown in Fig. 51, as the pieces below the joint a, Fig. 49, may be supplanted by the single strut s, Fig. 51. Of course the truss in Fig. 49 would be more rigid, on account of the principals being continuous and from a certain amount of support offered by the top of the wall, but the thrust on the wall would be the same. This thrust would act in the direction of the strut s, and would evidently be applied at the point where the strut rests on the wall or corbel. To keep the truss, Fig. 51, in equilibrium it is evident that the wall must be capable of resisting the outward component of the thrust in the strut, and that the joint a must be sufficiently rigid to prevent the truss racking under a severe wind pressure. If we do not wish the truss to exert an outward thrust we must connect the points c, d, e and f (Figs. 49 and 50) in such a way that they cannot change their relative position. This can best be done by means of iron or steel rods or bars, as shown in Fig. 52. It is evident that as long as these rods hold it will be impossible for the feet of the principals to spread or to exert a thrust on the walls. 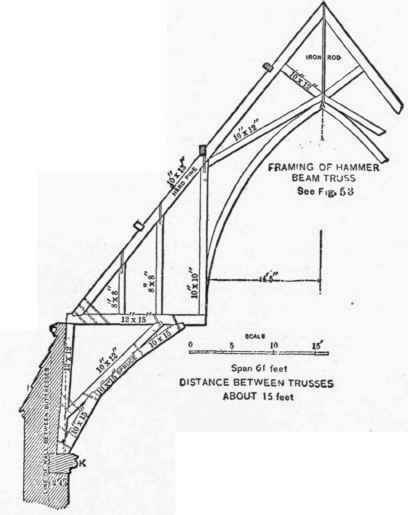 Furthermore, when these rods are used it is impossible for the joints c and e to drop, and hence the braces under the hammer-beam will not be required We thus see that a hammer-beam truss can be constructed in two ways - first, with a horizontal thrust which must be resisted by the walls and, second, without a horizontal thrust. In the first case a brace beneath the hammer-beam is absolutely necessary; in the second it is not. In practice the inclined tie-bars, shown in Fig. 52, are quite impossible, as they would spoil the desired effect, and it would be better to use a different type of truss. A straight wooden tie would also be objectionable for the same reason, so that if a tie is to be used, curved wooden ties must be employed to obtain the architectural effect. The object, therefore, of the bent pieces b, Fig. 49, and the corresponding pieces in Fig. 48, is to form a tie to take the place of the iron bars shown in Fig. 52. 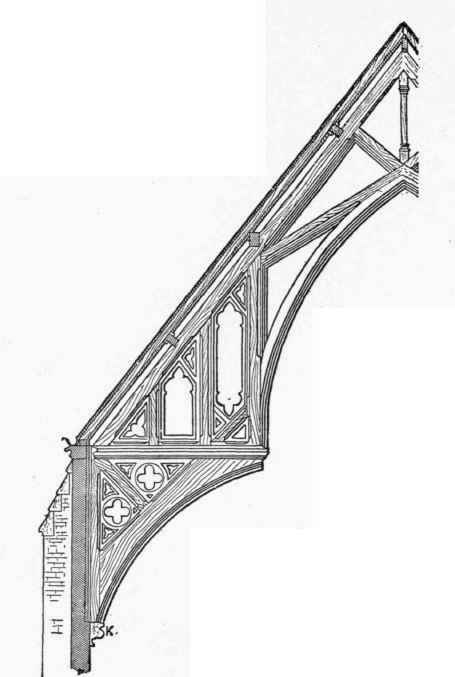 If the entire outward thrust of the principals is taken up by the inclined ties the strain becomes very great in proportion to the loads on the truss, so that in a truss of 36 feet span or more it is quite impracticable to put in curved pieces that will have the necessary resistance, and dependence must be placed upon the walls and braces to assist the curved ties. Fig. 53. 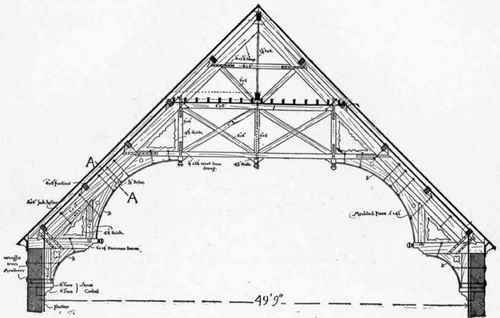 - Hammer Beam Truss; First Church, Boston. When using trusses of this type, therefore, the wall should be made very thick, and, if possible, reinforced by buttresses or cross walls, and the curved ties should be made so as to unite the joints c, d and e as efficiently as possible. They should not be bent, but should either be cut out of a single piece or built up to the desired shape with pieces well bolted together. In all such trusses a good-sized king-rod should be used, as the curved ties will be useless without the king-rod to connect them with the peak. The king-rod can be concealed by the wooden kingpost, which can be built around the rod, as in the truss shown by Figs 53 and 54. All parts of the truss should be carefully computed, and no dependence should be placed upon the ornamental work and finished casings, although these add slightly to the resistance of the truss. All joints at the intersection of the pieces should be made as secure as possible, as this adds much to the resistance of the truss and reduces the thrust. Figs. 53 and 54 show the construction of a modern hammer-beam truss designed in the office of Messrs. Ware & Van Brunt, architects, some twenty-four years ago. Fig. 53 shows one-half of the finished truss and Fig. 54 the framework. The truss is cased with black walnut and has a very handsome effect. It may be noticed that the upper part of this truss is a scissors truss, and there is no collar-beam. In this respect it differs from all the old trusses that the author has seen. 22. Fig. 55 shows another and quite different form of a hammer-beam truss. In this truss the only resistance to the outward thrust offered by the truss is the transverse strength of the principal and curved rib at the section A, A. It must be evident that if this truss should fail it would be by the breaking of the principals near this section, and that the least flexure in the principal will cause the lower brace to push out on the wall. If the walls, however, are sufficiently stable to resist the thrust, then the principals become merely struts and there is no transverse strain. 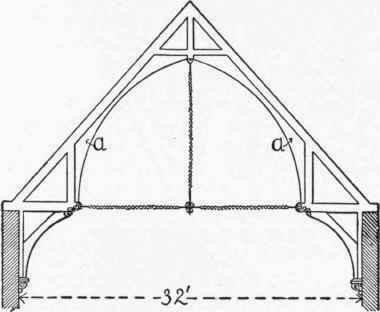 Very often in churches the trusses occur at an interior angle, as shown in Fig. 56, in which case the resistance of the wall is ample to take up the thrust and the curved ties are unnecessary except for architectural effect. 23. When it is desired to support a hammer-beam truss on a clerestory wall without making the wall very thick or bracing it from the outside, a form of truss like that shown in Fig. 57 may be used to advantage. This truss has the appearance of a hammer-beam truss, and when placed over a high nave the effect of the rods is not objectionable. The tie-rods should extend through the hammer-beams to their outer end. For a truss of 32 feet span a 1 1/4-inch square bar will be ample, and it may be twisted to give a more pleasing effect. The curved ribs a, a, in this truss are not in tension but in cornpression, and the braces under the hammer beams are necessary to resist the vertical component of the thrust in the curved ribs. A truss similar to this was used in the new Grace Chapel, New York City. 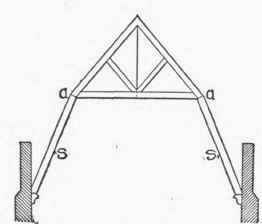 Several other examples of hammer-beam trusses are given in Chapter IV (Outside Finish, Gutters, Shingle Roofs).